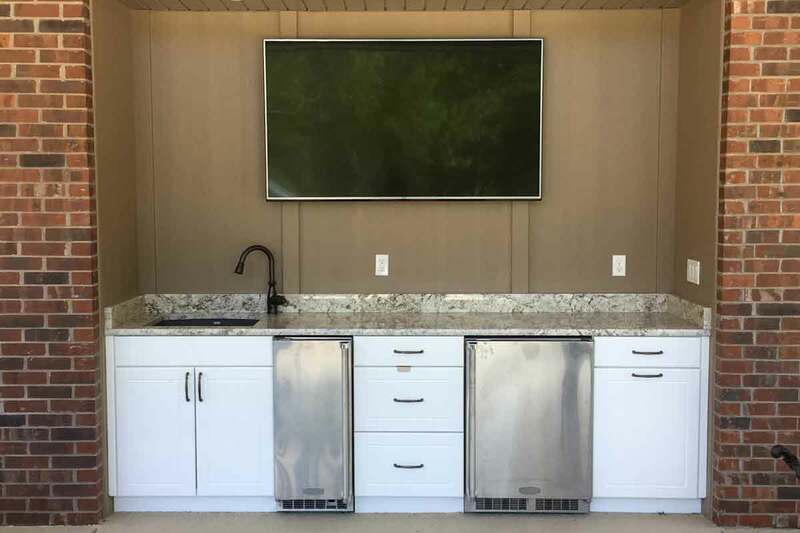 Werever Outdoor Cabinetry requires very little maintenance. Even neglected, dirty cabinetry can be rejuvenated by simply washing them. Follow these simple tips to keep your cabinetry looking great all the time. Werever’s cabinets are extremely chemical resistant too. Some products that damage other outdoor cabinets are just fine to use on Werever’s outdoor cabinets. Wash exterior of cabinetry with water and a soft cloth or sponge as needed. If the cabinetry is particularly dirty, wash the exterior with a mild detergent as you would wash a car. A soft bristle brush may be used to remove dirt if needed. Dry the cabinetry with a soft towel or chamois to prevent water spots. To enhance the look of the cabinetry, wipe the cabinetry periodically with a vinyl protectant such as Armor-All using a micro fiber cloth. Do not scrape or scrub the cabinetry with anything abrasive as this may permanently damage the surface. Do not paint or stain the cabinetry. Pool chemicals (like chlorine tablets, liquid chlorine, acid, etc.) will not damage the cabinetry, but the fumes from these chemicals may damage the hinges over time. To limit damage to the hinges, apply a stainless steel protectant or silicone spray to the hinges periodically. 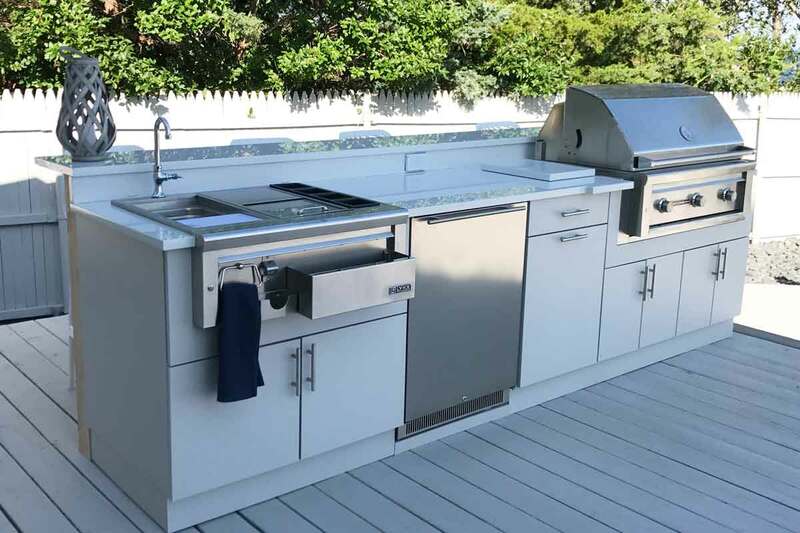 Stainless steel items such as door & drawer hardware, grills, appliances, and other parts of your outdoor kitchen separate from the cabinetry do require maintenance. 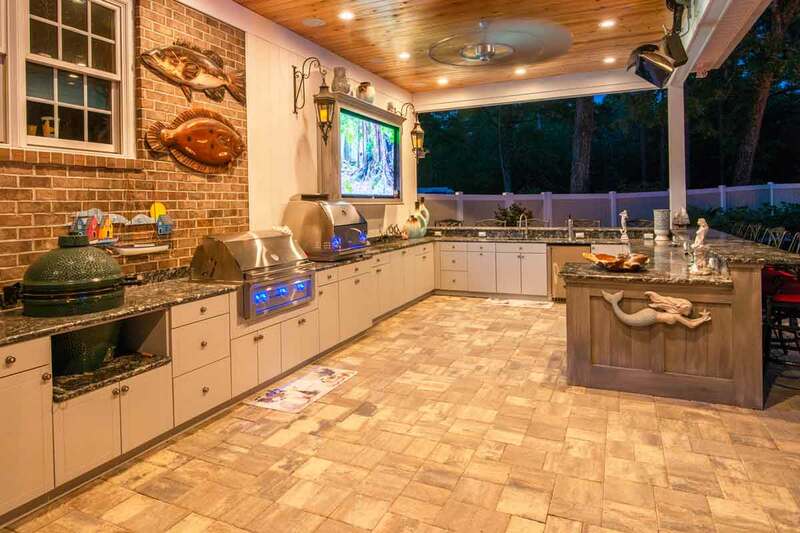 There is no such thing as a maintenance free metal anywhere in outdoor kitchens. Remember, stainless steel is engineered to stainLESS. It is not stain-proof steel. 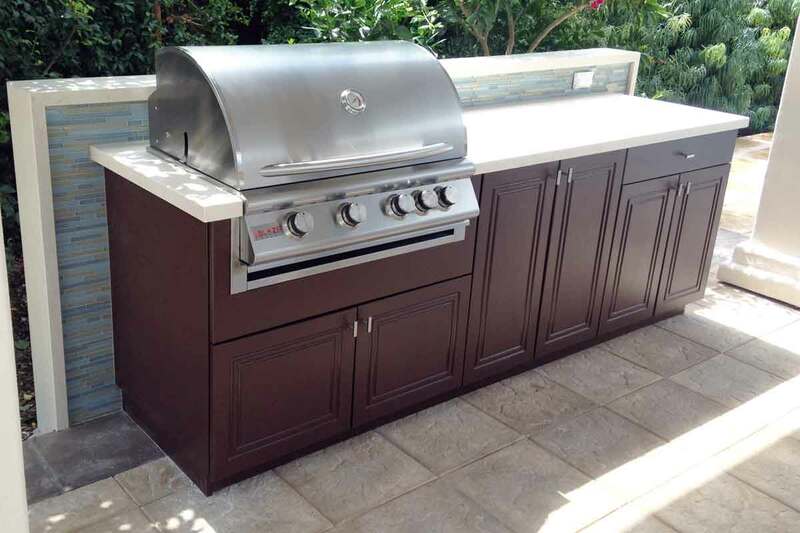 Carefully follow the care and maintenance instructions provided with your grill or other outdoor appliance. All grills require surface cleaning and protectant. Door hardware should be periodically cleaned with a stainless steel cleaner and protected by a stainless steel protectant after cleaning. You can use a scotch brite pad (gently) and WD-40 to remove surface corrosion and marks from door and drawer hardware. Be careful when using anything abrasive to remove stains or rust from stainless steel, especially grills. Stainless steel has a grain pattern. Scrubbing aggressively, especially in a circular motion or against the grain can mar or scratch stainless steel. Always follow the instructions for your particular appliance exactly. It is important to clean and protect stainless steel on a preventative basis. Do not wait until there is a problem to begin maintenance on steel items. 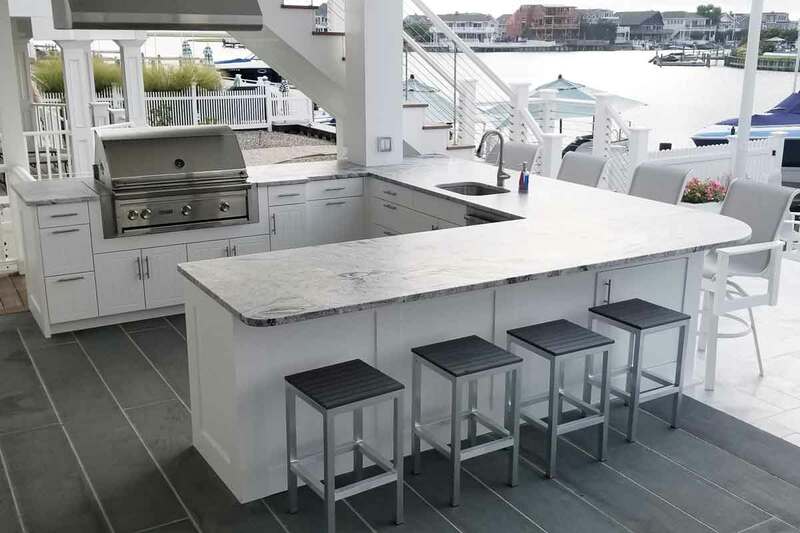 Outdoor kitchens on oceanfront property or near saltwater should be cleaned and protected much more than typical. 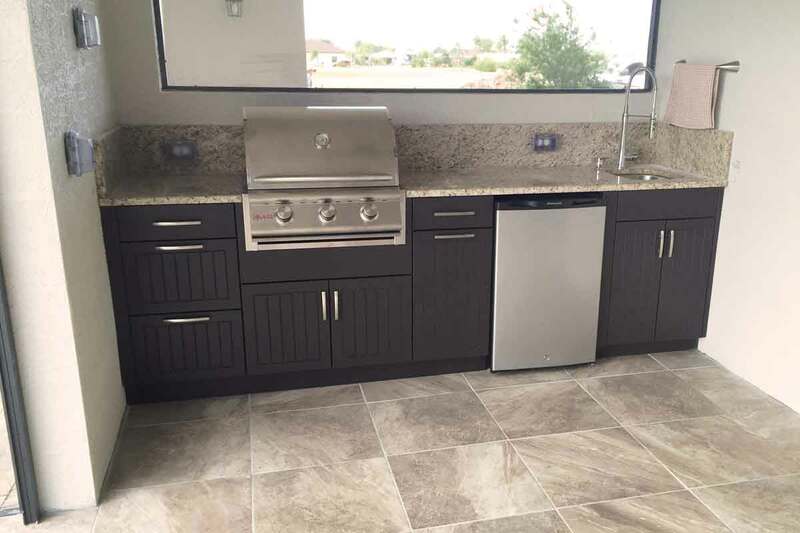 Many appliance manufacturers will not cover staining or corrosion under warranties if it is obvious that preventive maintenance has not been performed. Please note, grill covers do not replace the need for cleaning and protecting stainless steel. Sometimes, covering a wet grill traps moisture against the metal and actually promotes corrosion and rusting.